Eagle Scout and Olympic gold medalist Steven Holcomb visited the 2010 National Scout Jamboree on Monday to reconnect to his Scouting roots. Holcomb was the driver for the 2010 U.S. Olympic bobsled team, nicknamed “Night Train,” that shocked the sporting world with a major upset when they took the gold in Vancouver, B.C., earlier this year. Weighing in at 231 pounds and 5-foot-10-inches tall, Holcomb is the premier bobsledder, leading his team to their first Olympic gold medal in 62 years. He and his team also claimed several gold and silver medals at various bobsled races around the world on the road to Olympic triumph. At Sunday’s Grand Centennial Parade in Washington, D.C., Holcomb joined Scouts in the festivities by riding in a DeLorean in the parade. “Seeing all the Scouts out there was incredible,” Holcomb said. Otherwise, he said he enjoyed being part of such a huge event, and decided to visit the first day of the jamboree, an event he never had the opportunity to attend while a Scout. Growing up in Park City, Utah, Holcomb was a member of Troop 72 and earned his Eagle Scoutaward at age 15. He was not aware of the national opportunities in Scouting, although he did attend an area jamboree in Utah where he had lots of fun. Named the 2010 Men’s Bobsled Athlete of the Year for his leadership, Holcomb looks to his roots in Scouting for the foundation of his accomplishments. “Just because you are a Scout doesn’t mean you will be an Eagle Scout,” Holcomb said. “You have to put your mind to it. It took me nine years to earn Eagle and 12 years to win a gold medal,” he said. “There is the reward at the end.” He expressed his appreciation for the opportunities Scouting gave him as a youth, as many do not have the opportunity to proceed through Scouting. 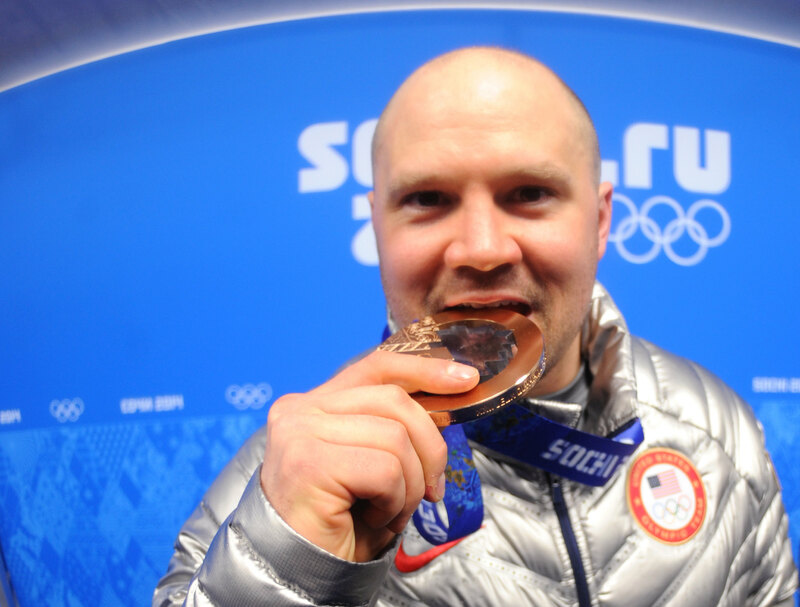 To achieve his goal of winning a gold medal in bobsledding, Holcomb had to set goals and overcome many challenges. One of his biggest strug- gles was a degenerative eye disorder that left him almost blind. He even considered retiring from bobsledding before a new medical procedure restored his sight to 20/20 and revived his career. The teamwork skills he honed in Scouting and his seven years in the Army National Guard helped him lead the Night Train team in a grueling sport. Holcomb works toward cooperative teamwork that allows input from each team-member.